This is what $190,000 can get you. Unveiled at an exclusive customer event at the Nurburgring, the new BMW M4 GT4, teased last year, is the most extreme iteration of the M4 to date priced at a cool 169,000 Euros. Speaking at the event, BMW Motorsports Director, Jens Marquardt said: “We are looking forward to seeing the car enjoy success in the hands of our customer teams from 2018. We are offering our customers a sophisticated and reliable GT4 car, which incorporates all of BMW Motorsport’s expertise, coupled with the strong basis provided by the BMW M4 Coupe. 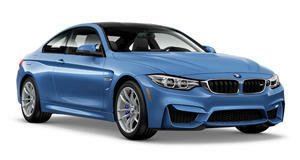 The development of the BMW M4 GT4 focused on mileage, cost efficiency and ease of maintenance.” The 431-hp 3.0-liter inline-six engine, seven-speed dual-clutch transmission and control electronics have been borrowed from the M4, the carbon hood comes from the M4 GTS, while the seat, brakes and pedal box were influenced by those found in the M6 GT3. Unique elements of the M4 GT4 include carbon-fiber doors, motorsport-specific front splitters and rear wings, and a racing exhaust system. The GT4’s beefy body has been aerodynamically optimized in the wind tunnel. 18-inch alloys come wrapped in Hankook tires and house large AP Racing brakes, 6-piston 390 mm up front, 4-piston 355 mm at the rear. The suspension boasts motorsport-specific control connections, adjustable motorsport stabilisers, specially-adapted Ohlins shock absorbers, and springs with three spring rates. A stripped-out interior has been made “as comfortable as possible” to ensure the driver is focused purely on driving the car. The BMW M4 GT4 is also the first racing BMW to get power sticks that can be pre-programmed for different engine performance levels. The Plug-and-Play system allows drivers to adjust the ‘Balance of Performance’ depending on the race. Having completed 20,000 miles of testing, the next stage of the car’s development is this weekend’s Nurburgring 24 Hours, where Jethro Bovingdon will be join the team to serve up his expert opinion.